Charcoal holds a key to improved soil vitality. Reported effects are impressive. Level of response varies with the temperature the charcoal is produced at. Low temperature charcoal is better. The soil improvement process that charcoal initiates is poorly understood. I want to see this at work for myself. Briquets are no good for my experimental use. They are made with a high-boron binder, and the temperatures that are used to produce them leave few wood gas condensates. At some point I'll find a supply or locate a collier. In the meantime I'm making my own, just to see what it takes. 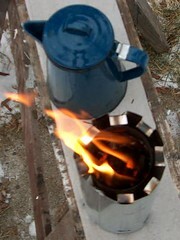 I made a few small batches of low-temp charcoal with a retort fashioned from a cracker tin. It produced impressive volumes of smoke, so I got on a track of finding out how that smoke might be put to good use. Thomas B. Reed, Biomass Energy Foundation president and CREST gasification list moderator, has been working on a better understanding of inverted downdraft gasification. He is passionate about improving the efficiency of cook stove fuel use in third world countries. Thus his perennial effort to perfect a household-size inverted downdraft gasifier. Of interest to soil scientists, some of his designs have the capacity to produce charcoal. Tom Reed designs have inspired others. In 2003 Ray Garlington produced a simplified design. I modified Ray's design to be able to shut it down and hold the charcoal. I used it to boil a cup of water with only a small handful of cedar. It was 2 deg F outside but not a problem. I even produced a fair bit of charcoal. Photos of my run are posted on Flickr. Thanks for posting this. My concern is that the charcoal production from this is so low that it would discourage use/sequestration as agrichar. What I am looking for is a wood gas burner capable of producing a minimum of 5 gallons volume of charcoal per batch. Ultimately my ideal is that a guy with a hoe in Indonesia sees burial of the char as a better means of survival selling the charcoal as fuel.